The Laminina Sleeping Bag's comfort mummy cut is snug for added warmth; it maximises warmth and fit whilst minimising weight. 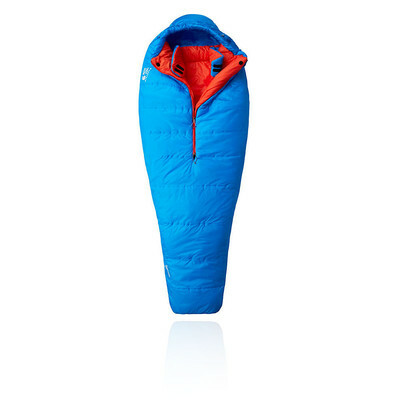 A half-length zip has been added to the front of the sleeping bag which allows the user to quickly and easily adjust the fastening when they are in or out of the bag. Dual sliders have also been added to the zip which minimises weight but still allows the wearer to adjust the fastening and provides ventilation when it is needed. A down-filled face gasket comfortably blocks drafts at the opening of the hood to keep you protected and reduce any wind chill. The comfort footbox allows natural foot position to bolster comfort, and prevent the feeling of being restricted which may lead to injury or discomfort. A zippered pocket at the shoulder provides accessible storage for small essentials. Lastly, a nylon compression sack and mesh storage sack are included so that you can compress and carry your sleeping bag with ease over long hikes or treks. Half Length Zip - Ensures quick and easy adjustments. Weight - 2 lb 10 oz. Bag Shape - Performance Mummy Cut. Bag Loft - 5 in / 13 cm. EN Rating - T-COMFORT: 32 F / 0 C.
EN Rating - T-LIMIT: 21 F / -6 C.
EN Rating - T-EXTREME: -10 F / 23 C.
Bag Stuffed Size - 7 in / 18 cm x 16 in / 41 cm. Inside Length - 84 in / 213 cm. Shoulder Girth - 66 in / 168 cm. Foot Girth - 41 in / 104 cm.